Oftentimes, my clients say they know what they want, but they think they aren’t explaining it in a way that makes sense. Sometimes that’s true, but more often than not, they are providing direction in a roundabout way; it just requires a little bit of detective work and a little bit of intuition. This has made me somewhat of a decoding sleuth over the years. The key, really, is to listen carefully, ask the right questions, and understand the goals and objectives of the organization and project. The answers are clues that help build a graphic strategy and strong, successful concepts. 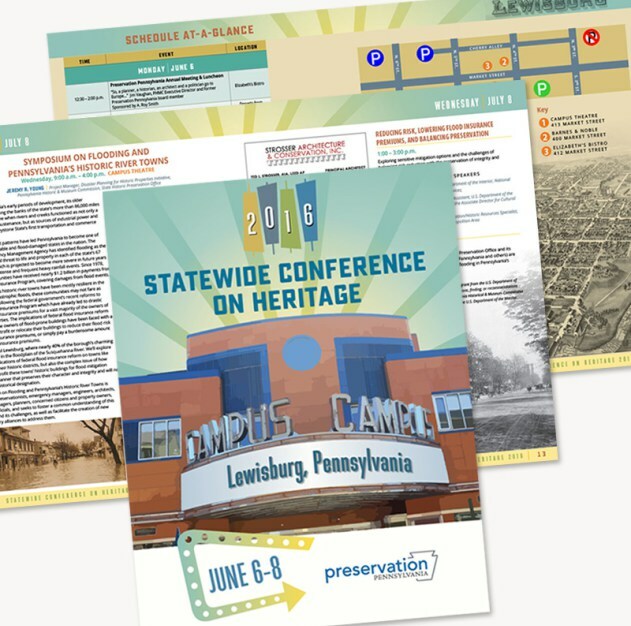 Preservation Pennsylvania wanted a retro look for their 2016 conference program. With a few supplied images and some “clues” from the client, we developed a vintage-inspired program featuring a warm muted color palette (shown at left). “I’ve said it before, I’ll say it again. So amazing to see the transformation from a bunch o’ stuff to something that looks great and ‘real’!” – Sabra Smith, Preservation Pennsylvania. Thanks, Sabra. We love working with you too!